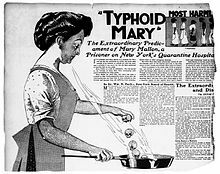 Bha Mary Mallon (An Chorr Chríochach an t-Sultainn 23, 1869 – an t-Samhain 11, 1938), cuideachd àitheanta ri Typhoid Mary, 'na ciad neach 'sna Stàitean Aonaichte a bheirsinn an ionnanachd neach-giùlain slàinte an fhiabhrais bhric. Air feadh a dreuchd mar còcaire sa' cheàrnaidh Eabhraig Nuadh, tha 53 luchd àitheanta a bhith air chur fo tinneas troimhpe, is bhàsaich trì nan luchd seo as a' ghalar. Tha a suaicheantas ann an cuid airson a diùltaidh dhealasaich a pàirte fhèin 'san sgaoilteadh a' ghalair, còmhla le a diùltadh a stadadh a h-obair mar còcaire. Bha i air chur gu danarra air leth dà uair air North Brother Island le ùghdarrasan slàinte fhollaisich agus bhàsaich i air an eilean. 'S e comasach gun rugadh i leis a' ghalar, oir bha a màthair tinn leis an fiabhras bhreac fad a leatromachd. PBS NOVA site: "The Most Dangerous Woman in America"
Air a tharraing à "https://gd.wikipedia.org/w/index.php?title=Mary_Mallon&oldid=537978"